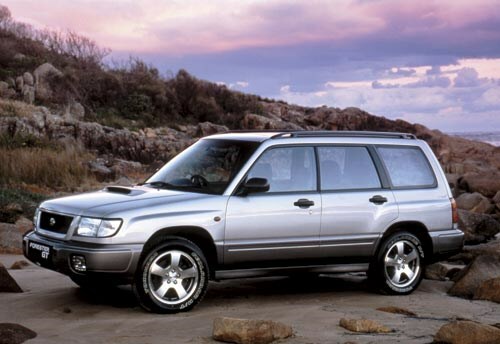 The original 1997 Subaru Forester hit a sweet spot before this segment grew fatter and soggier. But the first Forester GT, from September '98, stands alone with its lower centre of gravity and economy, strong turbo engine and all-wheel-drive clearance. Despite its Impreza origins, this is not a WRX super-wagon, and better for it. The GT-specific EJ20J engine offered 125kW at 5600rpm and 240Nm at 3200rpm on an 8.5:1 compression ratio, versus 160kW at 5600rpm and 290Nm at 4000rpm from the WRX's higher-compression (9.5:1) EJ20G engine. The GT turbo delivers more than twice the boost at 1500rpm, but then tapers off as the WRX turbo wakes up for better economy, longer life and extra flexibility. The GT's 1405kg over the WRX's 1245kg reflects a stronger, safer structure. It was available first as a GT, or GT Luxury with leather trim, electric sunroof and heated seats. 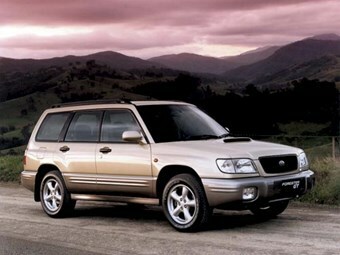 The January 2000 MY00 update brought fresher styling and cabin upgrades, but a single GT model with a trim option. Front and rear suspension settings were tweaked. The November 2000 MY01 upgrade added cruise control and a six-stack in-dash CD. Engine output was also boosted to 130kW/245Nm. Note that the AWD system for the manual splits traction equally front-to-rear whereas the different auto system is mainly front drive with extra rear traction only when required. Prices for the top early examples are still firm from $7000 and peak in the $12-13,000 range for the last and most desirable of the series. Check mods are reversible, legal and insurable as many are turned into street cruisers or more serious off-roaders. Check early inner-rear tyre wear and scrubbed outside-left front. Routine four-wheel alignment and rotation a must to spread wear from GT performance. Cheap, mismatched tyres can ruin GT's sharp handling and balance. Different sized wheels or tyres fitted to the same axle can destroy diffs. Brakes work harder, despite GT upgrade, so check rotor thickness and pad quality. Correct oil/filter essential as early as 5000km to avoid carbon build-up/sludge. If thrashed before warm-up and shut down too quickly, check for engine rattles/turbo woes. Cam belt replacement at 100,000km must be factory, as it has vital seals/parts. Clutch hydraulics fail or generate judder if fluid is not flushed and bled regularly. Premium fuel can boost engine flexibility and life by reducing engine temperatures and pinging, and postpones heat-cracking of exhaust. Big-bore exhausts can reduce back pressure critical to low-speed torque/turbo effectiveness; may kill air-flow meter. Aftermarket air filters can damage parts. Check driveshaft boots for splits front and rear.